Will You Serve God or Satan? "You must have to serve. If you don't serve Kṛṣṇa, then you will have to serve māyā. There are two things: God or Satan. So similarly, God is Kṛṣṇa, and Satan is māyā. So if don't..., if you refuse to serve God, then you have to serve Satan. That's all. You cannot become master. This is called dharma. Dharmaṁ tu sākṣād bhagavat-praṇītam (SB 6.3.19). And, as it is said here, vedo nārāyaṇaḥ sākṣāt. Vedo nārāyaṇaḥ sākṣāt. Veda, the knowledge, the law or the order, that order is from God. Therefore there is no difference between the Vedas and Nārāyaṇa. Because Nārāyaṇa, or God, is absolute, He personally and His word, it is the same thing. And in the material experience also we see that the government and the government law is the same thing. You cannot say that the government law is different from government. This is material example. And spiritual is still more perfect. Vedo nārāyaṇaḥ sākṣāt. In other words, that you cannot make any law. The government can make law. Similarly, you cannot manufacture any religion. Nārāyaṇa sākṣāt. Nārāyaṇa, God, He can make. You cannot make at your home, 'I have manufactured a type of religion.' No. That you cannot do. Nowadays this is going on. Yata mata tata patha: 'You can manufacture your own religion.' This is going on. 'You are okay; I am okay.' 'I manufacture my religion. You manufacture your religion. Don't fight. Let us become brother.' This is going on. So how you can be brother? The dog remains a dog. How they can become brother? It is not possible. Therefore so many religious systems, they are all rascaldom. One religion. That is the order of God. That is religion. If you want one religion, then you must know who is God and you must abide by the order of God. That is religion, very simple thing. You cannot manufacture, concoction. That is not religion. Therefore Bhāgavata, it is said, dharmaḥ projjhita-kaitavaḥ (SB 1.1.2): 'All these cheating type of religion is rejected, kicked out from Śrīmad-Bhāgavatam.' What is that religion there? Paraṁ satyaṁ dhīmahi (SB 1.1.1): 'The Supreme Truth, the Absolute Truth, we are accepting.' This is religion. So the Absolute Truth is Kṛṣṇa. So Kṛṣṇa is God, accepted in the Vedas. That is... Kṛṣṇa also says in the Bhagavad-gītā, ahaṁ sarvasya prabhavaḥ (BG 10.8). From Vedic knowledge, you get all knowledge. So if you don't accept Kṛṣṇa as God, that is also your mistake. You do not know God, but here Kṛṣṇa presents Himself as God, and He is accepted by authorities. So you have to accept. If you say that 'I don't accept Kṛṣṇa,' then you have to present somebody else if you know God. And if you say that 'I do not know what is God,' then you have to accept Kṛṣṇa, because you do not know. Here the authority says, 'Kṛṣṇa is God.' So you have to accept that. You cannot deny it. So Kṛṣṇa is the Supreme Personality of Godhead, and Kṛṣṇa means Nārāyaṇa. Therefore it is said, vedo nārāyaṇaḥ sākṣāt. Veda means... Therefore knowledge or religion means what is ordained, what is described by the words of Kṛṣṇa, Nārāyaṇa." 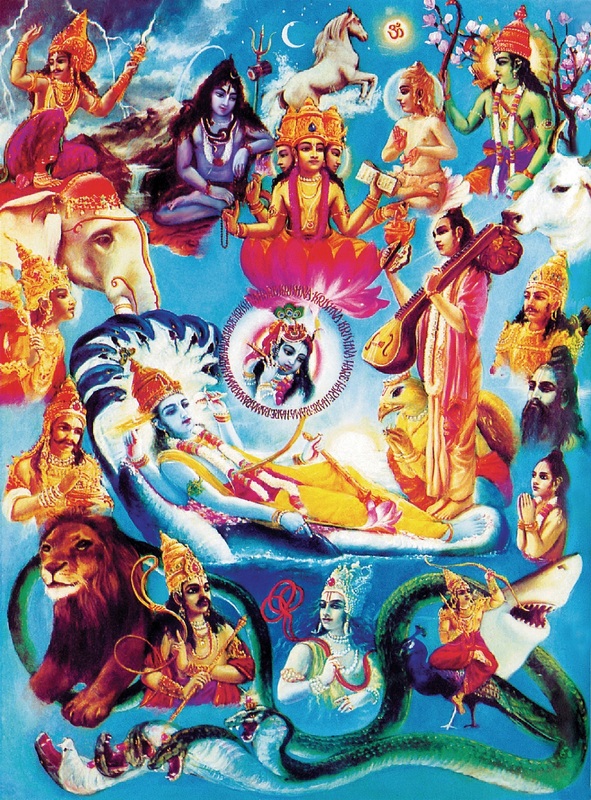 Pictured above (Bhagavad-gita 10.41): A sampling of Krishna's infinite manifestations, both in the spiritual and material worlds. Outer circle (clockwise beginning from the upper left-hand corner): Indra carrying the thunderbolt, the Himalayas, Lord Shiva with the Ganges River in his hair, the moon, the horse Ucchaihsrava, the transcendental om, Kapila, Rama, flower-bearing Spring, Kamadhuk, Arjuna, Vyasadeva, Prahlada, the shark, Vasuki, Skanda, Varuna, Yamaraja, the lion, Kuvera, Agni and Airavata. 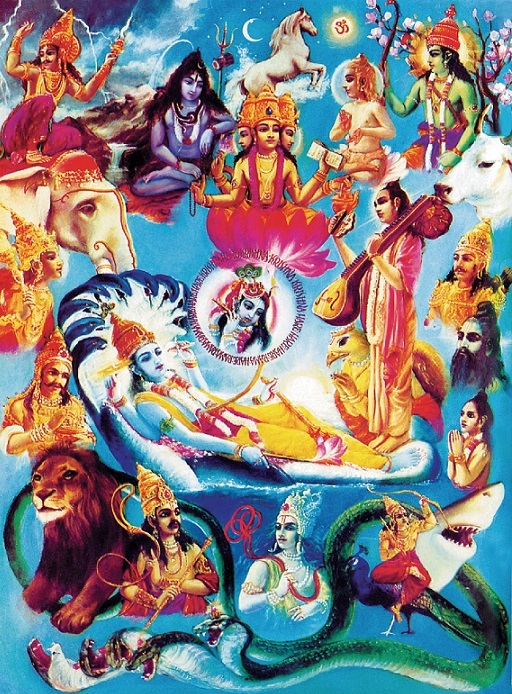 Inner circle, clockwise (beginning from four-headed Lord Brahma sitting on the lotus flower): Brahma, Narada, Garuda, the sun, the ocean, Lord Vishnu, Ananta, Krishna in the center encircled by the holy names—Hare Krishna, Hare Krishna, Krishna, Krishna, Hare Hare/ Hare Rama, Hare Rama, Rama Rama, Hare Hare.